In 1972 I was in the south of France. I had eaten some bad fish and was in consequence rather ill. As I lay in bed I had a strange recurring vision, there, before me, was a concrete building like a hotel or council block. I could see into the rooms, each of which was continually scanned by an electronic eye. In the rooms were people, everyone of them preoccupied. In one room a person was looking into a mirror and in another a couple were making love but lovelessly, in a third a composer was listening to music through earphones. Around him there were banks of electronic equipment. But all was silence. Like everyone in his place he had been neutralized, made grey and anonymous. The scene was for me one of ordered desolation. It was as if I were looking into a place which had no heart. Next day when I felt better, I was on the beach sunbathing and suddenly a poem popped into my head. It started out 'I am the proprietor of the Penguin Cafe, I will tell you things at random' and it went on about how the quality of randomness, spontaneity, surprise, unexpectedness and irrationality in our lives is a very precious thing. And if you suppress that to have a nice orderly life, you kill off what's most important. Whereas in the Penguin Cafe your unconscious can just be. It's acceptable there, and that's how everybody is. There is an acceptance there that has to do with living the present with no fear in ourselves. Penguin Cafe Orchestra founder Simon Jeffes describes how the idea of the band came to him. They were supported by Brian Eno, appeared with Kraftwerk, and their music has been linked with that of Philip Glass. Ten albums were released by the PCO between 1976 and 1997. Simon Jeffes died from a brain tumour in 1997. 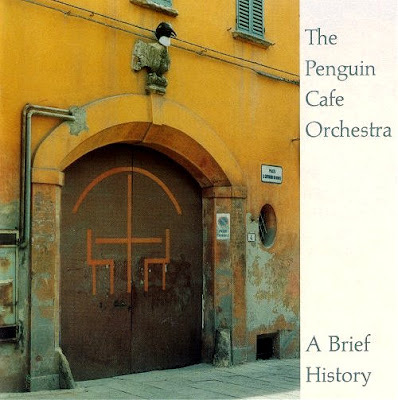 The Penguin Cafe Orchestra - A Brief History, seen in my header image, is currently available on CD. The Orchestra's official website is here. Random patterns that confirm our own prejudices? Email received:PCO, yes please!The Penguin Cafe Orchestra...good to find them featured on this path! restoration, but a labour of love as well). Such is the case with this music, it makes the world a better place!